We are thankful for yet another wonderful Character Playbook experience in collaboration with Character PlaybookTM, EVERFI and the Tampa Bay Buccaneers at Roland Park Middle! 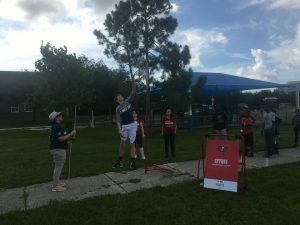 Students from Hillsborough County Public Schools learned the importance of character and healthy relationships through fun and active exercises meant to promote healthy communication and social-emotional learning. Activities included an inflatable obstacle course, a relay and a ‘pass and catch’ exercise to demonstrate the importance of communication. Character Playbook is the latest innovation in the more than 40-year partnership between the NFL and United Way, developed in response to the issues affecting young people, including bullying, cyberbullying and teen dating violence. Character Playbook is provided through a grant from United Way and is suitable for students in grades seven, eight and nine, and engages students with true-to-life scenarios that include bystander intervention strategies and positive relationship examples. The initiative was launched nationally during the 2016 NFL Draft and is powered by education technology leader EVERFI. 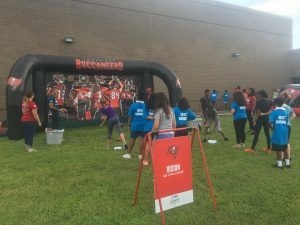 During the 2017-2018 school year, the Tampa Bay Buccaneers and United Way Suncoast reached 1,963 students and 24 schools in the region with Character Playbook, resulting in 3,224 hours of learning. After experiencing Character Playbook, students expressed high confidence in their ability to manage their relationships, resolve conflict in positive ways, and stand up for others if they are being treated disrespectfully. Additionally, after taking Character Playbook, students increased their scores on assessment tests by an average of 42%, from 60 out of 100 before the course to 85 after. “I liked how it prepared us to resolve conflicts and to build better, healthy relationships,” said one Tampa student. To learn more about Character Playbook and its impact, go to http://www.characterplaybook.com.